Dan Gillmor is founder of Grassroots Media Inc., a project aimed at enabling grassroots journalism and expanding its reach. The company's first launch is Bayosphere.com, a site "of, by and for the Bay Area." From 1994-2004, Gillmor was a columnist at the San Jose Mercury News, Silicon Valley's daily newspaper, and wrote a weblog for SiliconValley.com. He joined the Mercury News after six years with the Detroit Free Press. Before that, he was with the Kansas City Times and several newspapers in Vermont. 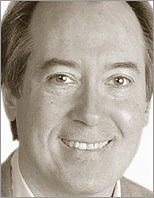 A Phi Beta Kappa graduate of the University of Vermont, Gillmor received a Herbert Davenport fellowship in 1982 for economics and business reporting at the University of Missouri School of Journalism. During the 1986-87 academic year he was a journalism fellow at the University of Michigan in Ann Arbor, where he studied history, political theory and economics. He has won or shared in several regional and national journalism awards. Before becoming a journalist he played music professionally for seven years. "If you plan to think any time during the 21st Century, this book is a must read [and] well-worth the investment. Reading this whole book was a good investment of my time, simultaneously demonstrating that 'traditional' technologies are by no means dead...I'm also impressed with O'Reilly as a publishing house. With a core of advanced-level programming tomes, their offerings now cover the social implications of digital technology." "So, just about the time we thought it might be best to burn all the presses & put an end to book publishing forever, we came across one of the best books on the subject, Dan Gillmor's We The Media: Grassroots Journalism by the People, for the People. What he describes as a transformation of journalism & some regard as a mutation of journalism we can all regard as a rapid evolutionary sea change that's of fundamental importance to us all. Appropriate here is the book's wonderful job of not only explaining & describing that, but also documenting it. We sit on the shoulders of many of the agents of change as change happens. We see the edges of the path (even factors like libel or insurance play a role since most citizen journalism is voluntary, unpaid & based more on passion than experience). We watch the fundamental tenets of professional journalism reborn in the lessons that these grassroots practitioners learn from their bruises. We The Media earns a rarely awarded Newstips Squeal of Approval."